Maize: Recent Progress in Chemistry and Technology covers the proceedings of a symposium on the progress in chemistry and technology of maize. The symposium is held at the Seventh World Cereal and Bread Congress in Prague, Czechoslovakia on June 28–July 2, 1982. This book is composed of 16 chapters that focus on considerable progress in the composition and processing of maize. This text initially covers the composition of lipids in maize starches and the hemicelluloses content of corn seed. It goes on discussing corn bran as a source of dietary fiber; extrusion cooking of corn flours and starches; and use of debranching enzymes in dextrose production. 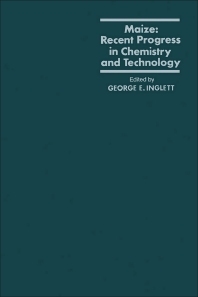 Other chapters examine the effect of composition and structure of maize on double enzyme processing; the utilization of maize flour in breadmaking; the energy preservation in maize drying; and the drying conditions related to wet-milling of maize. A chapter also examines the biochemical and microbiological changes in stored maize. Moreover, this book also describes the effect of mycotoxin contamination in the maize field. Finally, moisture determinations in maize and maize germ flour prepared by supercritical carbon dioxide extraction are considered. This book will be a useful reference for students, scientists, technologists, and manufacturers who are involved in any facet of maize production and utilization.